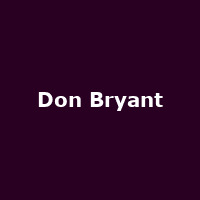 Don Bryant is an American rhythm and blues singer and songwriter (and Hi Records alumni) from Memphis. As a songwriter, Don wrote the Ann Peebles songs: "99 Pounds" and "Do I Need You." and "I Can't Stand the Rain" (co-written with Willie Mitchell). He released his debut album, "Precious Soul," in 1969, plus 2017's: "Don't Give Up on Love", with the gospel albums, "What Do You Think About Jesus? ", "I'm Gonna Praise Him" and "It's All in the World" released as Donald Bryant and a Chosen Few between 1987 and 2000.